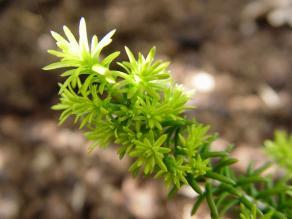 Heaths and heathers are an unusual group of plants that have few comparisons in the botanical world. They have evergreen needle-like foliage resembling conifer species, but their prostrate growth habit makes them useful as a groundcover. Of greatest interest, however, is their ability to flower though the winter months and their colored foliage that complements the blooms. Botanically, heaths are in the genus Erica and heathers belong the genus Calluna. Both grow as dense shrubby groundcovers, usually no more than two feet tall, though there are a few varieties that grow into larger shrubs with an upright growth habit. Though they resemble each other closely, they are only distantly related plants. They are used in the same way in the landscape, but there are important differences to be aware of regarding their looks and hardiness. Heathers have small scale-like leaves that lie flat on the stem, making them appear vaguely reminiscent of conifers from a distance. Heaths have actual needles like a conifer. The flower structure is very similar, as well, but heather flowers are generally bell-shaped, while heath flowers are urn-shaped. Depending on the variety, the latter can sometimes be seen in an elongated tubular form. Heathers are the more cold hardy of the two and are well-adapted throughout the northern half of the country, where they can sometimes be seen flowering in the snow. Heaths are better suited to the southern half of the country. These plants have a lot to offer to landscape designers, but they have very specific growing requirements that must be met. Like blueberries, rhododendrons, azaleas, hydrangeas, gardenias and a handful of other plants, heaths and heathers need acidic soil conditions and excellent drainage. Drainage can be accomplished by planting on a mound and mixing sand and compost in to the soil in areas with heavy clay. If the pH of your soil is above 5.5, these plants will not grow successfully unless you incorporate copious amounts of peat moss into the planting area or use products like aluminum sulfate to artificially acidify the soil. On the upside, heaths and heathers tolerate, even prefer, poor rocky soil that is low in fertility. They have low water requirements and are often used to landscape places where it is tough for most plants to grow, such as a steep rocky hillside. A minimum of six hours of sun per day is needed for the plants to thrive. However, they tolerate wind and salt spray and are useful for seaside landscaping applications, as well as in tough, exposed montane conditions. They are generally immune to pests and disease, so if a heath or heather plant is looking poor, it's more than likely because one of their many growing requirements has not been met. It's hard to rectify these problems after the fact, so think carefully about where you're planting them and test your soil first to see if it is sufficiently acidic. Though they are drought tolerant, heaths and heathers look best with regular moisture. Otherwise, the only maintenance necessary is to give them an annual shearing after the flowers have faded. Cutting them back about 30 percent keeps the foliage looking full and lush throughout the growing season. 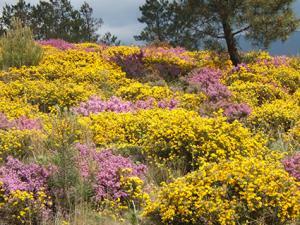 Heaths and heathers have exquisite coloration that should be accentuated in every possible way. It's often more effective to mix and match varieties of different colors rather than use large swaths of a single type. 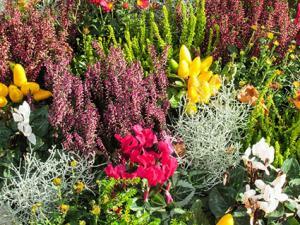 The various shades available of foliage and flowers all tend to blend nicely together. 'Alba Rigida' heather has white flowers and bright green foliage. 'Firefly' heather has magenta-red flowers and rust-colored foliage. 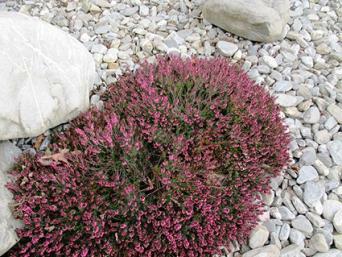 'Irish Dusk' heath has bright pink flowers with grey-green foliage. 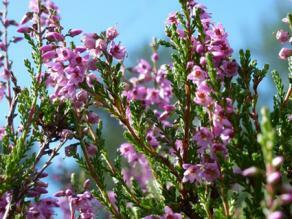 'Tenuis' heather has violet-colored flowers and dark green foliage. 'Bell's Extra Special' heath has reddish-purple flowers and green foliage flecked with yellow. If you can provide optimal growing conditions, heaths and heathers offer unique combinations of color and texture found nowhere else in the plant world. With the texture of conifers, the bright blossoms of flowering perennials, the colored leaves of exotic foliage plants, and a winter blooming period, they are true rock stars of a designer's palette.